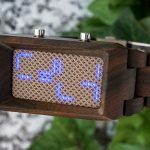 The Kisai Sequence Wood Link LED watch is a unique smartwatch made almost entirely of dark sandalwood. It has a similar design and makeup as Kisai�s other watch, the Xtal Wood Link smartwatch. 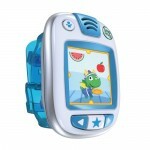 It uses a unique LED configuration � of which there are several colors � to show notifications and alerts from a connected phone. You can activate a �cryptic mode� which displays the LED configuration in various patterns. Currently, the Sequence Wood Link is only compatible with iPhones.